Looking for inspiration then look no further. When you’re fundrasing there really is something for everyone! 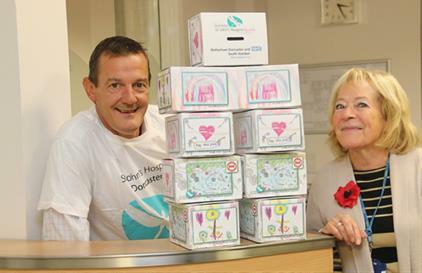 We’ve hospice collection boxes for your spare change – call in to our hospice or give staff a call to get one. We have hospice t-shirts in small, medium, large, XL & XXL and hospice running vests in small, medium & large for those taking part in fundraising events. We’ve hospice collection buckets and tins for events – the buckets and tins are provided with tamper proof security seals, and the tins come with or without security chains. If you are organising a fundraising event and need equipment to collect monies safely & securely, then please contact the hospice to discuss requirements. Get people to join in and get themselves sponsored – probably the best (and easiest) way to raise money. From a local cycle race, to riding wheeled toys, there are lots of ways to fundraise on wheels. Your area is full of fascinating stories, so dig some up, turn them into clues and organise a treasure hunt. Everyone will enjoy the adventure. Put jelly in your wellies for a great sponsorship idea for kids of all ages who fancy running the squelchiest race of their lives. Do your thing, sing, dance, do magic! Get sponsorship and don’t forget to sell tickets to all your family and friends. Keep schtum for the day. You might be surprised how much your family and colleagues will cough up in order for you to keep quiet! These are a great idea for green-fingered fundraisers. Spend the day in your pyjamas, dress as your favourite comedy character or put your clothes on back to front. Do it on your own or with colleagues or classmates and charge everyone to join in. These are always popular and hotly contested! Your legs, your chest, your back – if it’s hairy, get it waxed for cash. Make sure everyone comes in their pyjamas and bake lots of cakes and goodies. Do a sponsored stay awake or sponsored don’t yawn competition – see who can hold out the longest! Chocolate, biscuits, coffee – get sponsored to give up something you love. Have a charity bridge or poker game. Whatever your bag, have a knock-out contest and charge people to join a team. Charge admission and sell refreshments. A weekend adventure is the perfect way to promote teamwork within your company while raising money for charity. If you’ve a budding Beckham in the family, sponsor them to keep the ball in the air for as long as possible. Your friends and neighbors will love an Aussie-themed party, so stock up on the beer and fire up the barbie!